Even if you’re the biggest Jonas Brothers fan, you’ve never seen them like this! Can Nick, Kevin and Joe boot Kim, Kourtney and Khloe off the E! reality TV pedestal? Famous families are everywhere in Hollywood, but we don’t want to get to know all of them while they’re in their “natural” state. Whether we wanted to or not, we now know a ton about the Kardashians after “keeping up” with them for years. We’ve attended two of their weddings and saw one daughter give birth — we’re all practically family! Well, get ready to make room in your hearts and on your DVRs for a new set of siblings. According to the New York Post, E! has struck a development deal with The Jonas Brothers to film a “family reality show,” sources say. The new E! show will be based in New York, as Nick Jonas continues his Broadway run as the lead in How To Succeed in Business Without Really Trying. In addition, Kevin Jonas would be filmed alongside his wife, Danielle Deleasa, while Joe Jonas may appear solo and only sporadically. He revealed last month that he has found an apartment in town and will be spending more time in NYC, but no details yet on how often and how long those visits will be. 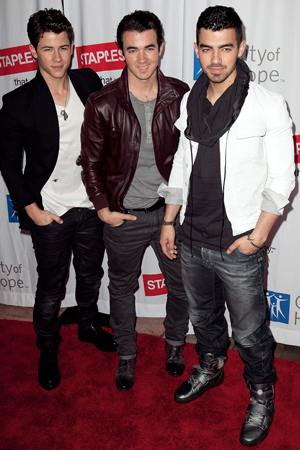 Nick did announce last month that he and his brothers would be reuniting to record their next album together. It won’t be the first time that someone’s made a reality show out of putting an album together (remember Ashlee Simpson‘s stab at reality TV? ), but it’ll definitely be the first time it looked three times as good!